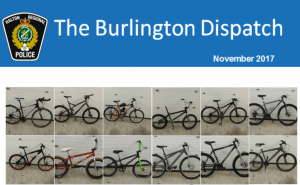 The Burlington Dispatch Information PDF has been released for the month of November. Each ward in the city receives a summary of traffic and crime concerns that have occurred throughout the month. 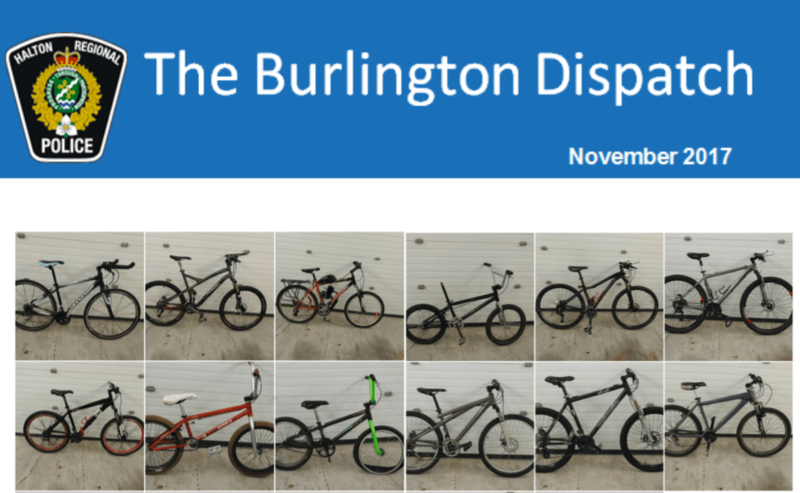 On Thursday, November 9, 2017, officers at #3 District Burlington seized several bicycles as a result of an ongoing investigation. Anyone with information regarding this incident is asked to contact the #3 District Criminal Investigations Bureau through Ms. Angela Oliver at 905-825-4747, ext. 2374. For the month of November in Ward 2, approximately 124 charges and warnings were issued; officers responded to approximately 44 property damage and personal injury collisions and made one impaired driving arrest. Wednesday, November 29, 2017, a traffic study was conducted at Pearl and Caroline street to address complaints from citizens regarding drivers not stopping at stop signs at this intersection. The results showed that out of the 473 attendants of the intersection throughout an hour, 30 vehicles did “rolling stops”, while 9 vehicles drove straight through. It is important all vehicles come to complete stops to ensure the safety of all citizens. Tips and information are provided in the November issue of the Burlington dispatch regarding holiday crime prevention for vehicle theft, online purchase safety and neighbourhood safety. The Dispatch also provides crime statistics about all areas of the city, broken down by Ward boundaries.